I’ve recently had a few people ask how I brew kombucha so I thought I’d spend sometime and detail my current process. You’re going to need some supplies before you can start brewing your very own kombucha tea. Mother SCOBY – If you know any cool people who are brewing kombucha already, you can just ask them for one; they’ll probably have lots! Starter tea – Your source of the SCOBY will probably also send you home with some tea. Brew container – I purchased two of these 2 gallon glass containers. Heating pad – You might not need this if you live in a warm climate but we keep our apartment pretty cool. I picked up two of these to keep my brew at 80 degrees. 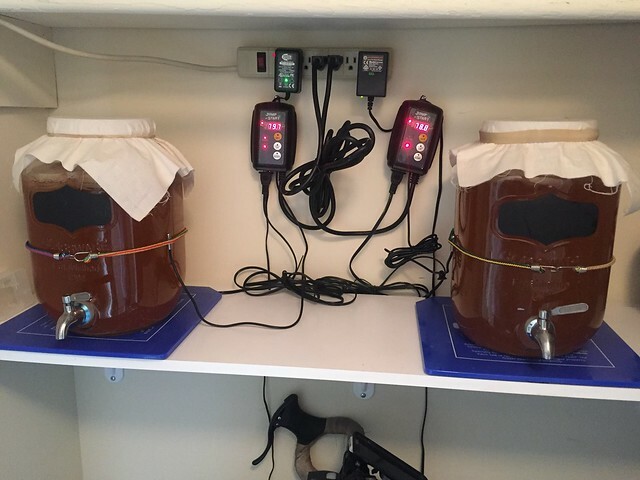 Here’s a photo of my brewing setup. You can search the web and there are some pretty standard ratios of water to sugar to tea for kombucha. When I was first starting out, I converted all that to metric because my containers were metric and plus it just made it easier to think about in my brain. I start by putting 1 liter of distilled water into a large pot and bring it to a boil. I take the pot off the heat and add the sugar, stirring so it will dissolve. Next, I add the tea in tea bags. Cover and let brew for 30 minutes. Next I remove the tea bag and add 4 liters of distilled water. You probably want to take the temp of your mixture because adding liquid to your brew container that’s too hot can damage your SCOBY. Everything on the web says 80-85 degrees. Put your container on the heading pad and wait 1 week. You can use a ph meter at the end of 1 week; you’re aiming for a measurement of 3. I need to improve our bottling methods as we just store the tea either in growlers or in individual kombucha tea bottles that we’ve purchased at the store. I’d like to invest in a kegerator.